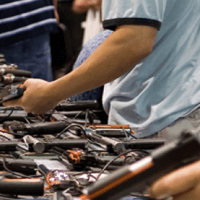 Since September 11, 2001, American military service personnel and their families have endured challenges and stressful conditions that are unprecedented in recent history, including unrelenting operational demands and recurring deployments in combat zones. 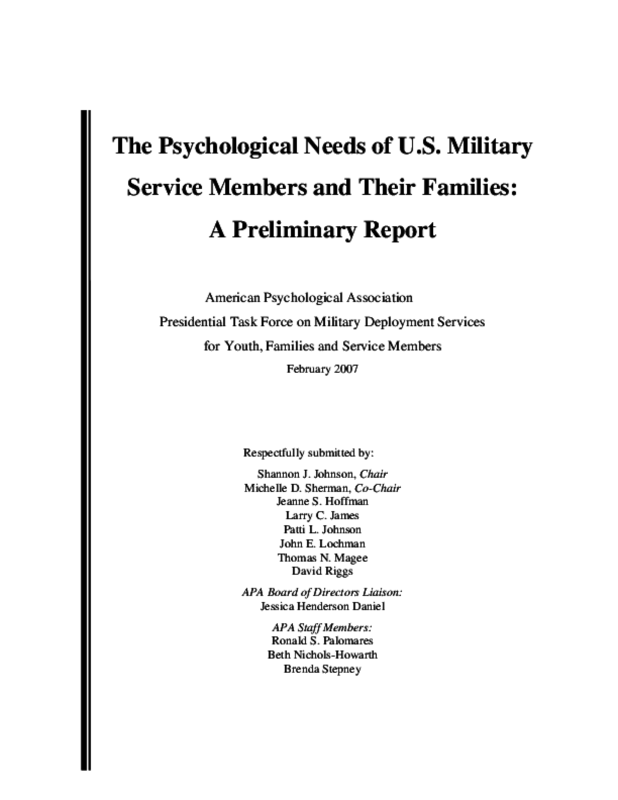 In response to concerns raised by members of the military community, the American Psychological Association (APA) President, Dr. Gerald Koocher, established the Task Force on Military Deployment Services for Youth, Families and Service Members in July of 2006. This Task Force was charged with: identifying the psychological risks and mental health-related service needs of military members and their families during and after deployment(s); developing a strategic plan for working with the military and other organizations to meet those needs; and constructing a list of current APA resources available for military members and families, as well as additional resources that APA might develop or facilitate in order to meet the needs of this population. 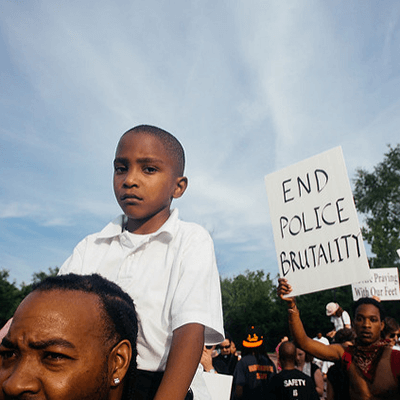 At present, 700,000 children in America have at least one parent deployed. Having a primary caretaker deployed to a war zone for an indeterminate period is among the more stressful events a child can experience. Adults in the midst of their own distress are often anxious and uncertain about how to respond to their children's emotional needs. The strain of separation can weigh heavily on both the deployed parent and the caretakers left behind. Further, reintegration of an absent parent back into the family often leads to complicated emotions for everyone involved. 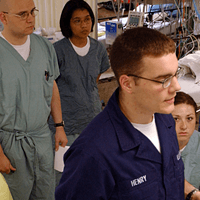 This Task Force was established to examine such potential risks to the psychological well-being of service members and their families, acknowledging the changing context and impact of the deployment cycle, and to make preliminary recommendations for change and further review at the provider, practice, program, and policy levels. To meet the Task Force charge, we will first provide an overview of what is currently known about the impact of military deployments on service members and their families (spouses, children and significant others). In addition, we will discuss a number of programs that have been developed to meet the mental health needs of service members and their families, and we will describe the significant barriers to receiving mental health care within the Department of Defense (DoD) and Veterans Affairs (VA) system. Finally, we will offer several general recommendations for improving the psychological care offered to service members and their Military Deployment Services TF Report 5 families, and we will outline some specific proposals for how existing APA programs and resources can be employed or modified to support military communities. 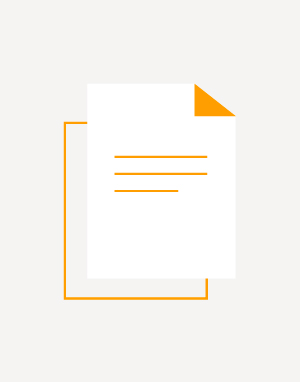 This issue brief covers the 1965 Immigration Act, the preference category framework, the immigrant visa petition application and approval process. 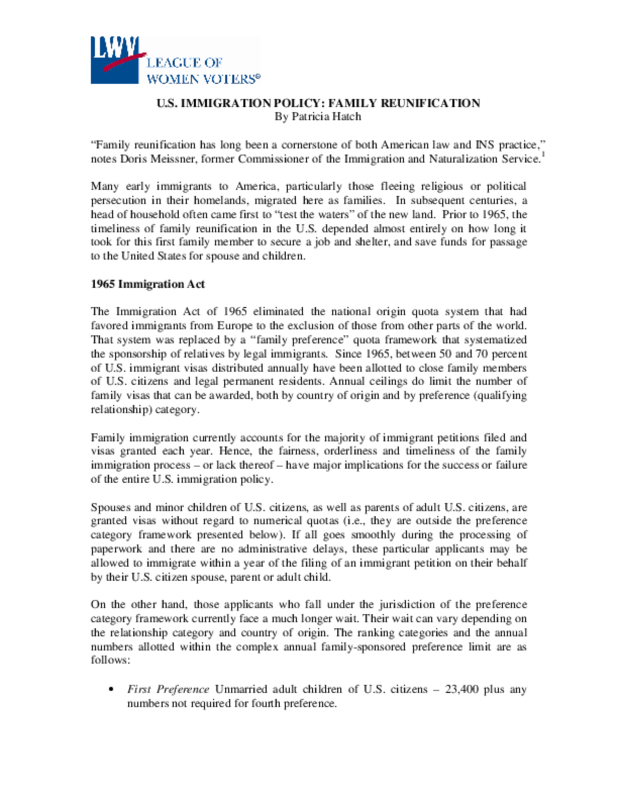 The author argues that family reunification is in jeopardy, and concludes with possible solutions and recommendations. 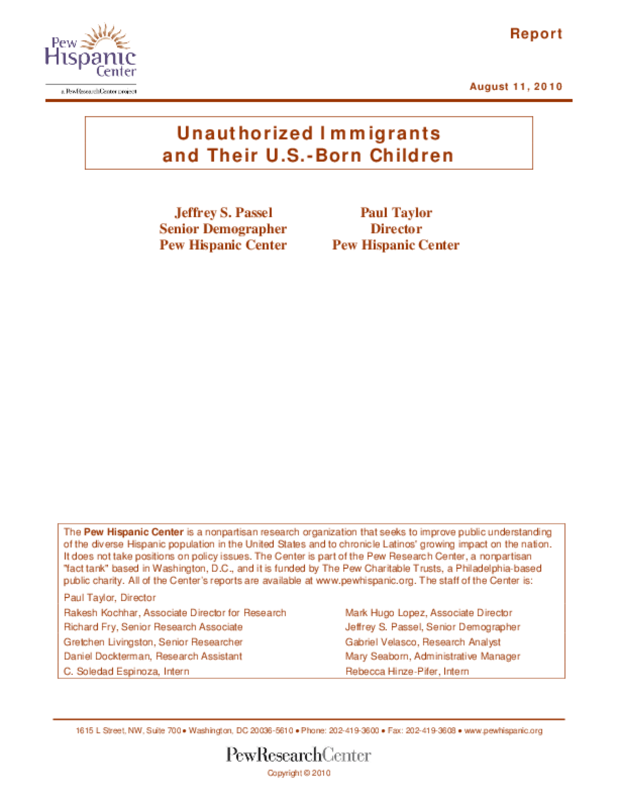 Analyzes data on the number, age distribution, fertility, and family structure of legal and unauthorized immigrants and the percentage of their children among all U.S. children and of the U.S.-born and foreign-born among their children. In 2015, 17% of all U.S. newlyweds had a spouse of a different race or ethnicity, marking more than a fivefold increase since 1967, when 3% of newlyweds were intermarried, according to a new Pew Research Center analysis of U.S. Census Bureau data. 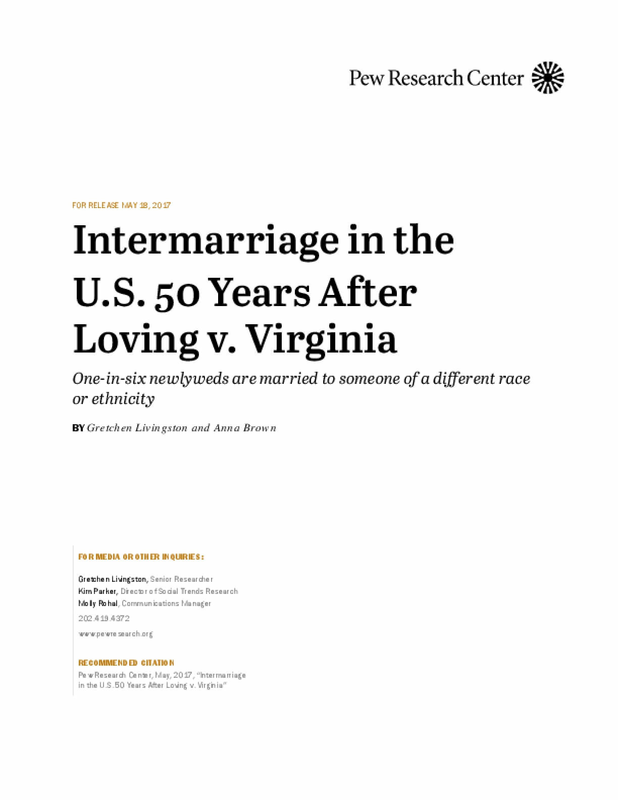 In that year, the U.S. Supreme Court in the Loving v. Virginia case ruled that marriage across racial lines was legal throughout the country. Until this ruling, interracial marriages were forbidden in many states. 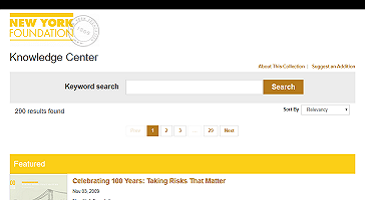 My dissertation focuses on the transnational history of intelligence testing in the twentieth century, and explores the relationship between war and international tensions, and psychometric testing. 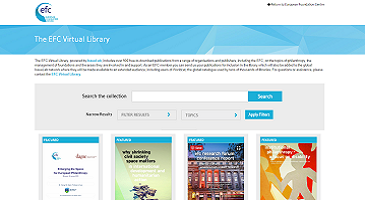 By examining major transnational actors and trends, principally from the United States, France, and Great Britain, it sheds light on the numerous connections between international conflict and the rise of population-based national psychometric testing programs. International conflicts over the course of the twentieth century helped to heighten consciousness and concern over the quality, as well as quantity, of national populations. Unprecedented opportunities to apply intelligence tests to large populations, which were in part created by the context of war, yielded mass amounts of testing data that elevated experts' concerns about national levels of intelligence at the same time that population experts vocalized anxieties about overpopulation. Experts from the fields of psychology, demography, genetics and eugenics spoke to these concerns in their research and advisory roles. This report is organized as follows. The first chapter provides an overview of trends since 1970 in U.S. births and birth rates among U.S.-born women and foreign-born women. 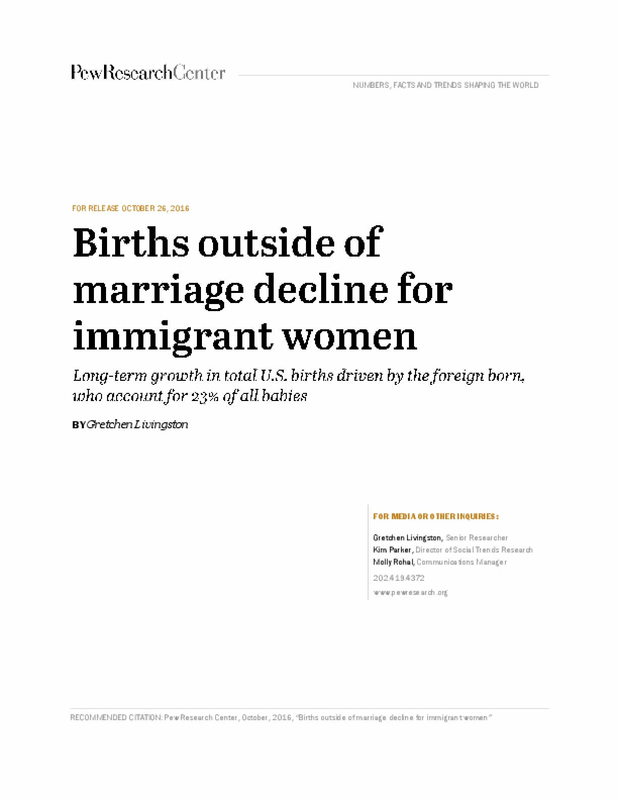 The following chapter zeroes in on the trend since 1984 in births outside of marriage, and what factors may be contributing to the growing gap in births outside marriage between U.S.-born and foreign-born women. 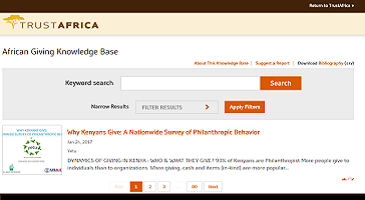 The third chapter examines differences by mother's nativity and region of birth on a number of other demographic and economic characteristics, including age, race, education, employment, financial well-being, years in the U.S. and English language skills. 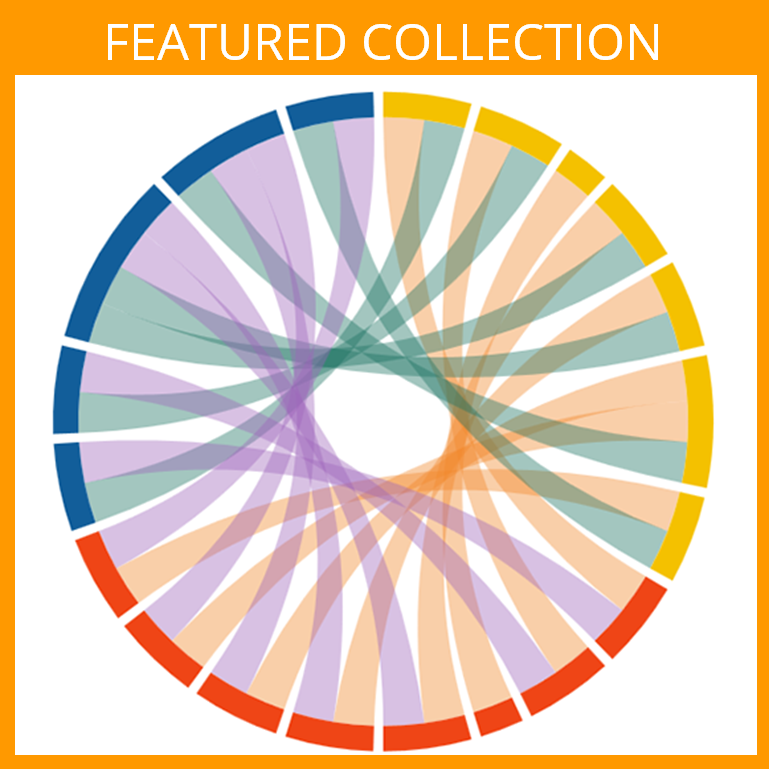 The last chapter examines the economic and demographic profiles of new mothers who were born in one of the nine countries and one U.S. territory accounting for the largest share of new U.S. foreign-born mothers. 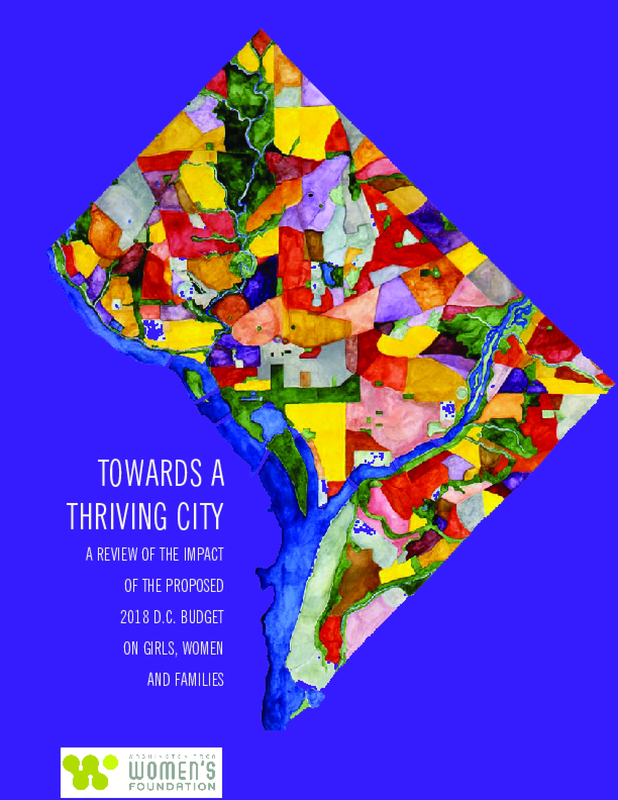 On April 13th, The Women's Foundation released our newest report, Towards A Thriving City: A Review of the Impact of the Proposed 2018 D.C. Budget on Girls, Women and Families. The report, the first of its kind for the Foundation, provides a detailed analysis of proposed expenditures in relation to the needs of low-income girls, women and families in the City in critical areas such as housing, childcare, social supports, workforce development and violence. We hope that the report will be used by residents, community advocates and other key stakeholders to advocate for programs and initiatives in communities that will help to build the long-term economic security of women and families. 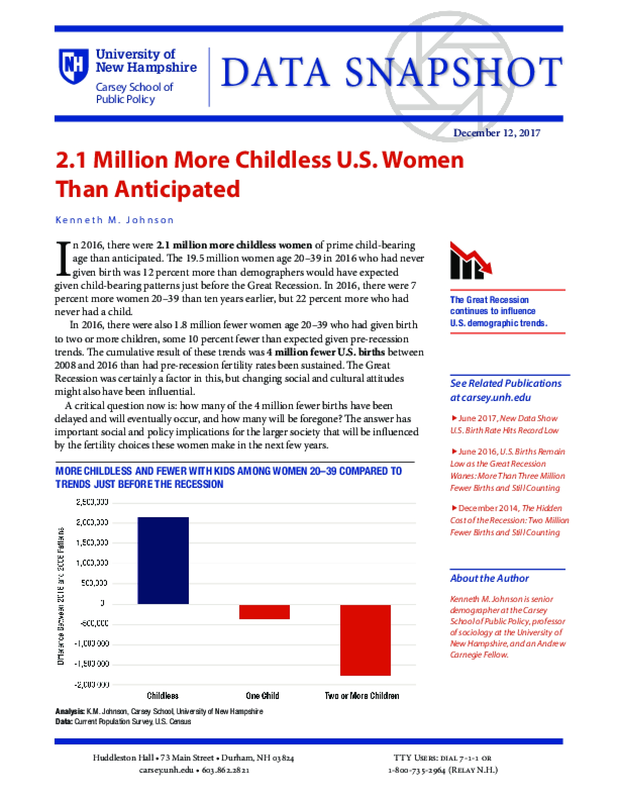 In 2016, there were 2.1 million more childless women of prime child-bearing age than anticipated. The 19.5 million women age 20–39 in 2016 who had never given birth was 12 percent more than demographers would have expected given child-bearing patterns just before the Great Recession. In 2016, there were 7 percent more women 20–39 than ten years earlier, but 22 percent more who had never had a child. 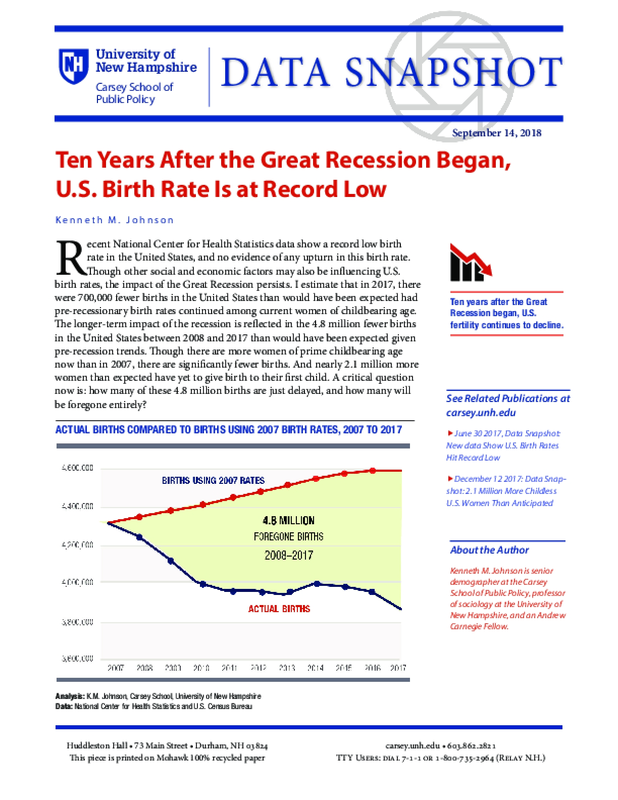 Recent National Center for Health Statistics data show a record low birth rate in the United States, and no evidence of any upturn in this birth rate. Though other social and economic factors may also be influencing U.S. birth rates, the impact of the Great Recession persists. I estimate that in 2017, there were 700,000 fewer births in the United States than would have been expected had pre-recessionary birth rates continued among current women of childbearing age. Misplaced Blame argues that much of the population growth overrunning parts of North America originates from five rarely noted root causes: poverty, sexual abuse, underfunded family planning services, subsidies to domestic migration, and ill-guided immigration policy. Along the way, Misplaced Blame uncovers one revelation after another. Some examples: - The population of the Pacific Northwest is increasing almost 50 percent faster than global population. 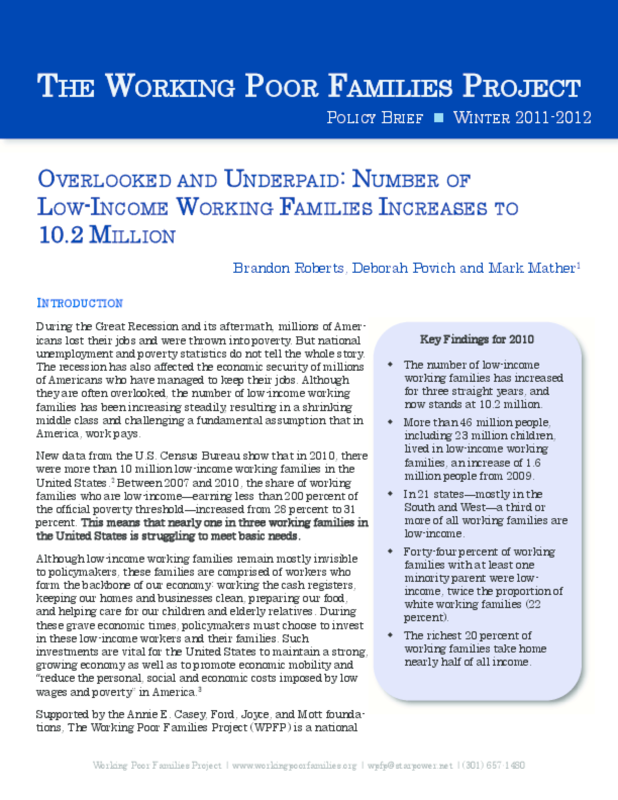 - 83 percent of American teen mothers come from poor families. - 62 percent of teen mothers have been raped or molested as children. 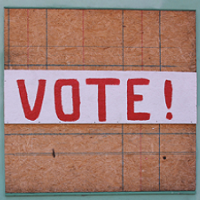 - 36 percent of babies born in the Northwest are conceived by accident. - Long-distance moving is subsidized by taxpayers. 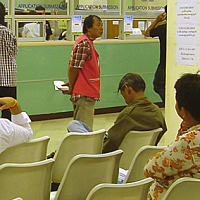 - Excessively high national immigration quotas hurt both the North American poor and immigrants' home countries. Read Misplaced Blame and you'll see that when we take care of people, population growth will take care of itself.